Richard Feynman, winner of the Nobel Prize in physics, thrived on outrageous adventures. 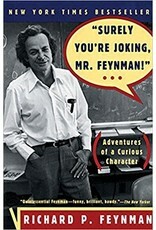 Here he recounts in his inimitable voice his experience trading ideas on atomic physics with Einstein and Bohr and ideas on gambling with Nick the Greek; cracking the uncrackable safes guarding the most deeply held nuclear secrets; accompanying a ballet on his bongo drums; painting a naked female toreador. In short, here is Feynman's life in all its eccentric―a combustible mixture of high intelligence, unlimited curiosity, and raging chutzpah.